After we received our engagement photos back, I wanted to play around with some of our favourite pictures to work on creating our save the dates. With my inspiration in mind, I was ready to play. I knew I wanted to have a black and white photo postcard with a splash of colour (which would play on the actual invitation suite I had already drafted). Since the Save the Dates were a stretch in our budget and not a necessity they had to be cheap. Before I get to the reveal (sorry!) I'm going to share how I went about making ours, and how it ended up saving us a ton of money. We decided to do Save the Dates for the practicality of sharing our date with our guests and directing them to check out our website before we send out the actual invitations. Having a postcard design saved us the cost of envelopes. The back gets referenced initially, but most people only care about the front to post on their fridge, so this was an easy thing for me to ditch*. To save money we decided to order shortly before Christmas when we knew we would be seeing a lot of our guests. We were able to save quite a bit on postage by hand delivering a majority of our Save the Dates. I liked the idea of getting Save the Dates out pretty close to the new year when people were starting to fill up their new calendars. Huh? This is a huge money saving tip. Because we were designing our Save the Date in photoshop, we didn't have to order a pre-designed Save the Date. Instead of shopping in the wedding section at Vistaprint, I went to the marketing materials. How much money did we save? Let me show you! For the sake of this post, I created the same image for the front and chose a standard back on Vistaprint (which you can do your own custom image for as well). I pretended to order 100 Save the Dates with recycled matte paper and a greyscale back (which is what we did in reality). This STD was selected under the custom Save the Date under Invitations and Stationary. You do have the option to order in increments of 10 for the invitations. This STD was selected as a Postcard under Marketing Materials. You only have the option of ordering in increments of 50 for Postcards. As you can see they both look the same (the back would be your own custom design). This is where it gets really interesting. The Horizontal Flat Invitation has five options in paper: premium glossy, premium matte, linen, matte (included) and recycled matte. The premium papers cost an additional $14.00, while linen and recycled matte are an additional $18.00. A standard white envelope is included. The Standard Postcard has three options in paper: glossy, recycled matte or premium glossy. The recycled matte and premium glossy are an additional $7.00. Standard white envelopes cost an additional $5.00. That's a huge difference for the exact same thing. Further proof that putting the word wedding on something drastically inflates the price. Adding $27.00 (plus postage)** didn't stretch the budget too much for us, which we're really happy about. We had to use those engagement photos for something! For me, it was totally worth it! On my next post, I'll share what we came up with! Did you send Save the Dates? Do you have any money saving stationary tips? *While the envelopes Vistaprint offers are inexpensive, I personally liked the look of a Postcard over the standard white envelope. 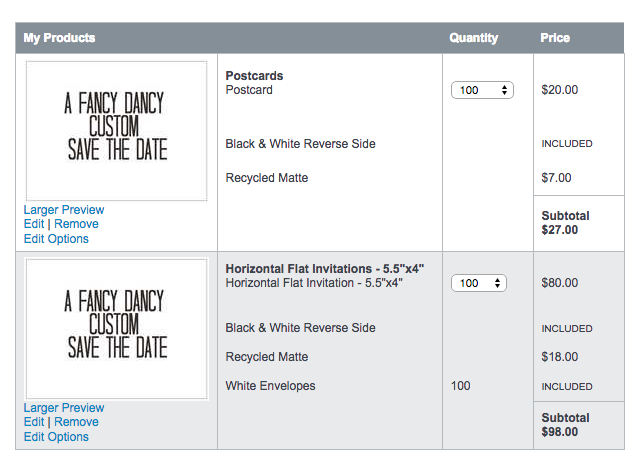 **Because of a promotion we paid just over $26 including shipping and tax, which actually got credited to us because of a scuff mark on the bottom of the first ten Save the Dates. This will take approximately $26 off of the cost of our invitations!